A week ago we left our apartment, the first step of moving back to Belgium. … Unless you’re living in French Guiana! 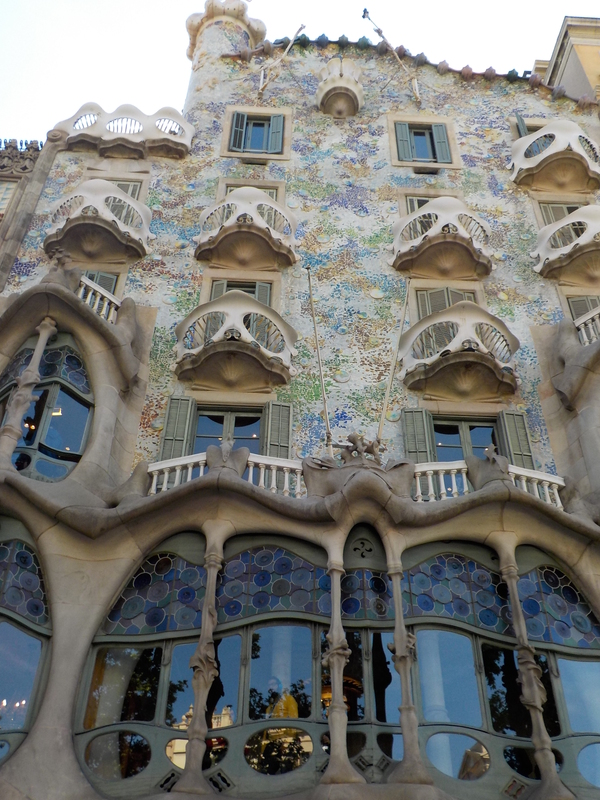 Two days before leaving our apartment, Lore went to Allianz (the insurance company). A young woman who was talking really really quietly helped her out. She welcomed her to her desk and asked what kind of insurance we had. It took her some time to do some ‘stuff’ (no idea what she was really doing…) on her computer, in the meanwhile her older colleague came in between ‘with what can we help you, madame?’ (ah, good question!). ‘Ah it’s for terminating your contract. Do you have a proof you quit the apartment, for example your residential lease inventory? Ah no, so you should come back later’. Two days later… ‘Ok, so we will pay you back the part of your insurance you won’t use anymore. Can you please give us your new address so we can send you the check?’ ‘Sorry madame, but in Belgium we don’t use checks anymore’ ‘whoat? Why not’ … ‘well, if you send us an email in which you explain you can’t receive checks and you send us a RIB as well, we will make sure you get the money by bank transfer’. Thank you! Enjoying a Belgian Beer with Friends! A week ago Leandro went to our bank to close our account. ‘Sorry sir, we can only close your account when the amount is €0’ … ‘No, we can’t do a money transfer to a Belgian bank’ Hmmm, strange! Next day, let’s try again with the same guy behind the desk: ‘No, I can’t close the account since you still have money on it, but I can do a transfer’ Yes please! ‘Please come back later this week to close your account’. Two days later, with the same guy: ‘To close your account you need to write a resiliation letter and I’ll do the rest’ Done! On Monday our account still existed. Back to the bank, for the 4th time! ‘Sorry sir, but the guy last week was an intern and he never reported to me you wanted to close your account’ ggggrrrrr ‘And I cannot close it now, because you have money on it’ Oh please, you can keep your €0.11 interest ‘please come back tomorrow’. Farewell party after Lore’s last Crossfit training – Thanks to Nicole for the nice picture! Recently we finished two consecutive campaigns. 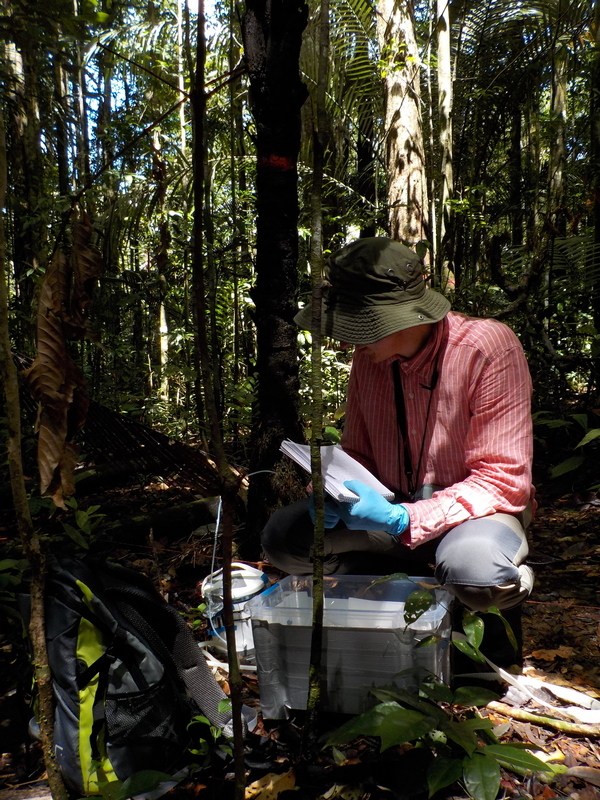 The first one was organised in September at the Nouragues – Pararé station, where we studied vertical profiles of photosynthesis in the canopy and collected canopy soils. 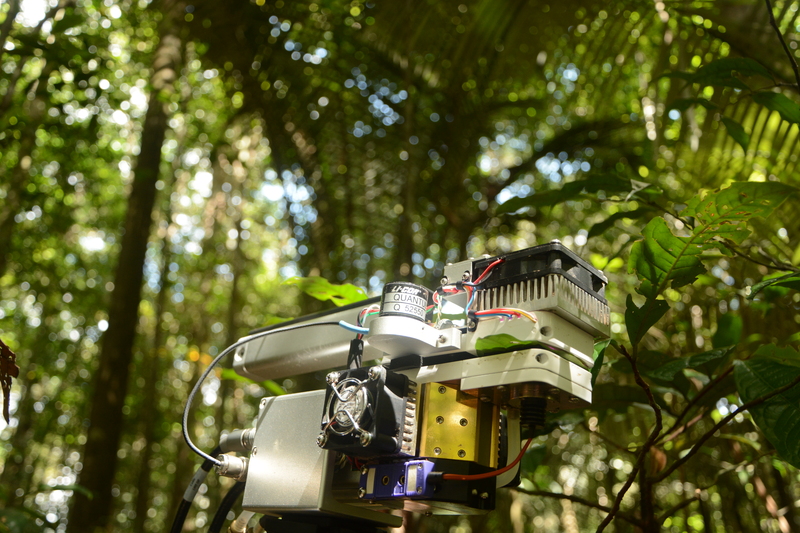 With this campaign we showed 3 PI’s (principal investigators 😉 ) of the project – Ivan Janssens, Philippe Ciais and Michael Obersteiner – how hard it can be to collect data in the tropical rainforest. Special thanks to Stefan, whose help on measuring sapling photosynthesis in August and climbing trees in September was greatly appreciated. 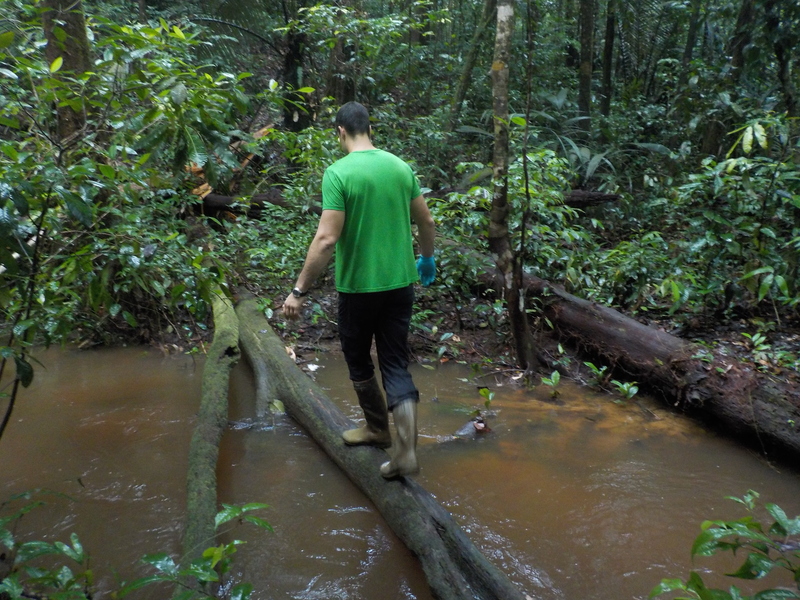 The second campaign was the dry season campaign in both Paracou and Nouragues after 1 year of fertilisation treatment. 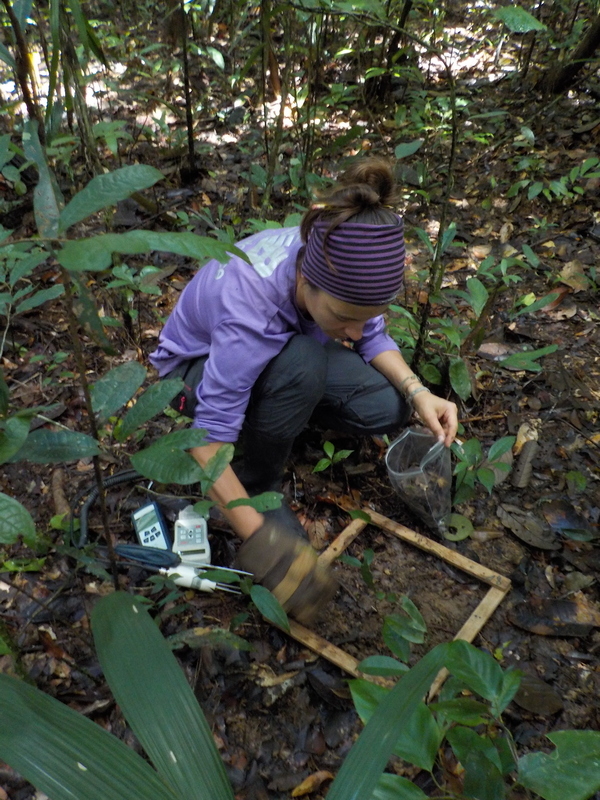 We collected soil and litter samples, along with a lot of soil respiration measurements, to study soil enzymatic activity, nitrogen fixation, VOC’s (volatile organic compounds) and nutrient availability. 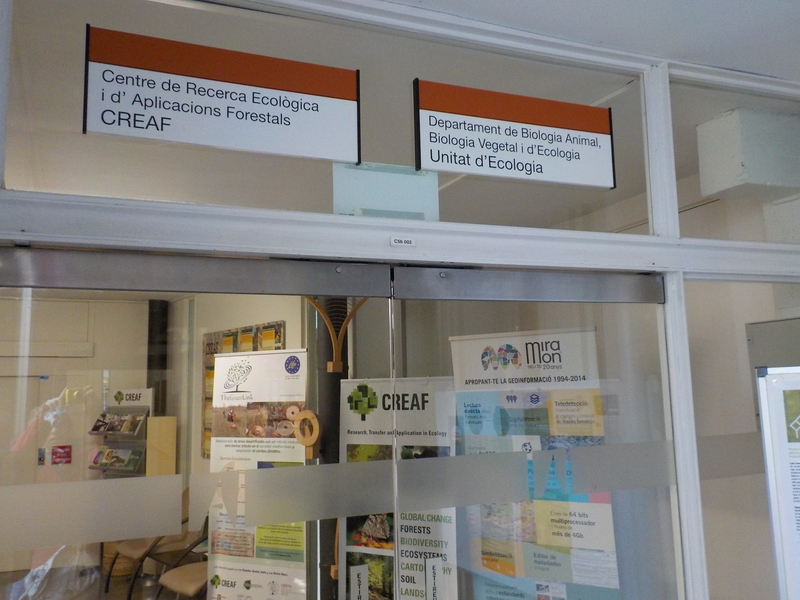 The sampling was pulled off together with our Spanish colleagues from CREAF, our Spanish partner in the Imbalance-P project. Afterwards we fertilised all our plots with their help for the 3rd time, carrying in total +- 800 kg of fertiliser into the forest. 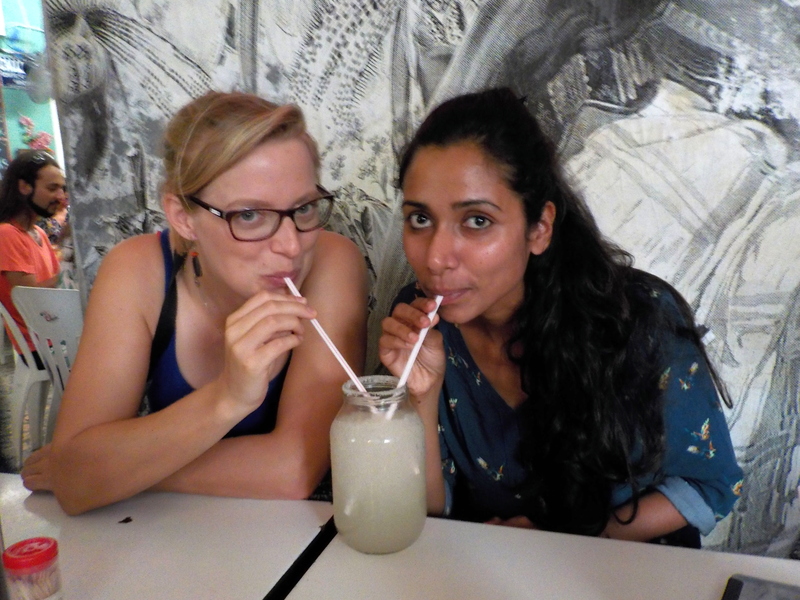 Now that all the extractions on fresh soils are finished, we can enjoy some holidays with Winnie and Nathalie, two friends from Belgium arriving the 6th of November in Cayenne. 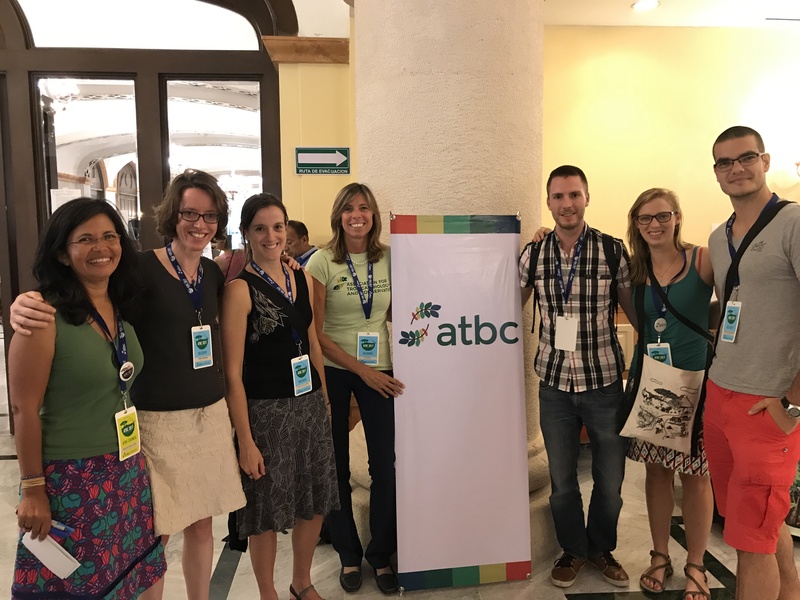 The ATBC 2017 meeting in Mexico was a success. 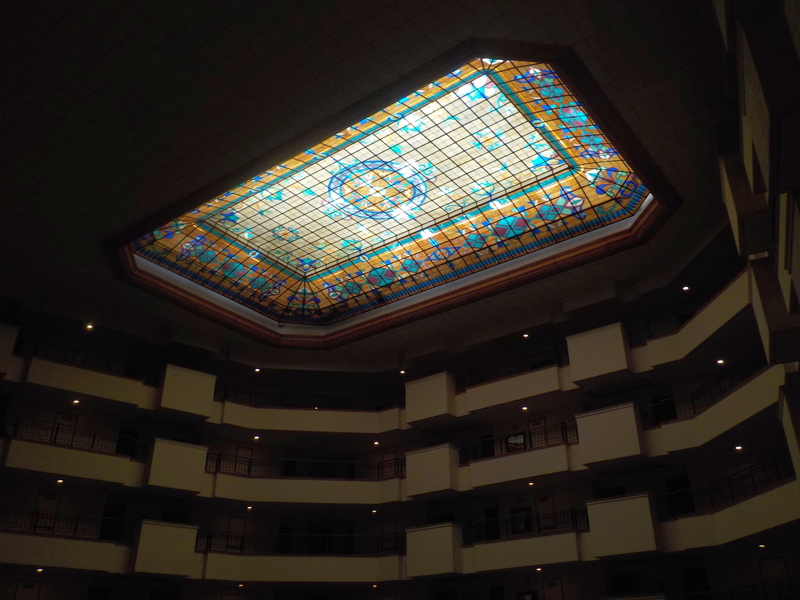 About 750 people from 40 different countries came together to discuss ecological and social dimensions of tropical biodiversity conservation. From the opening ceremony with musical performance, over the mentoring circle (where we get to know a lot of new people) and all the interesting sessions to the closing ceremony where Lore got awarded for best student poster (congratz! 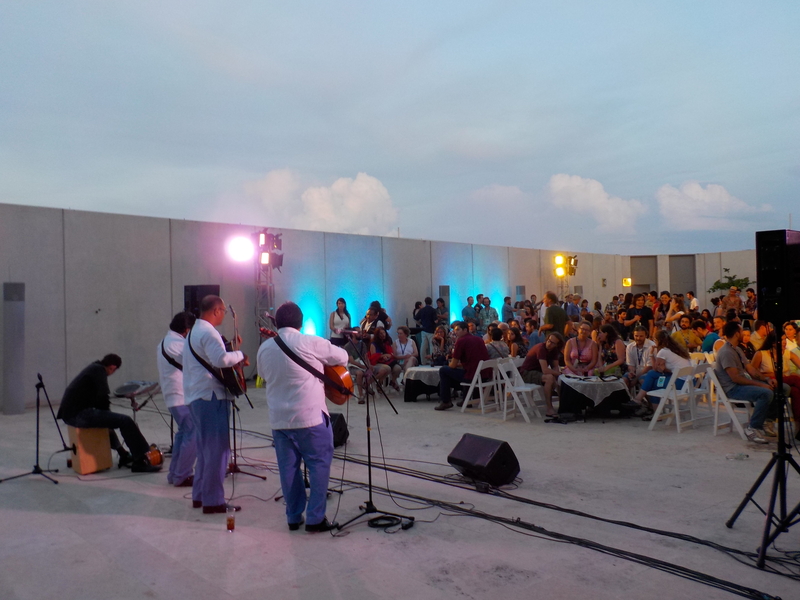 ), we enjoyed ourselves and were happy to get this networking chance! 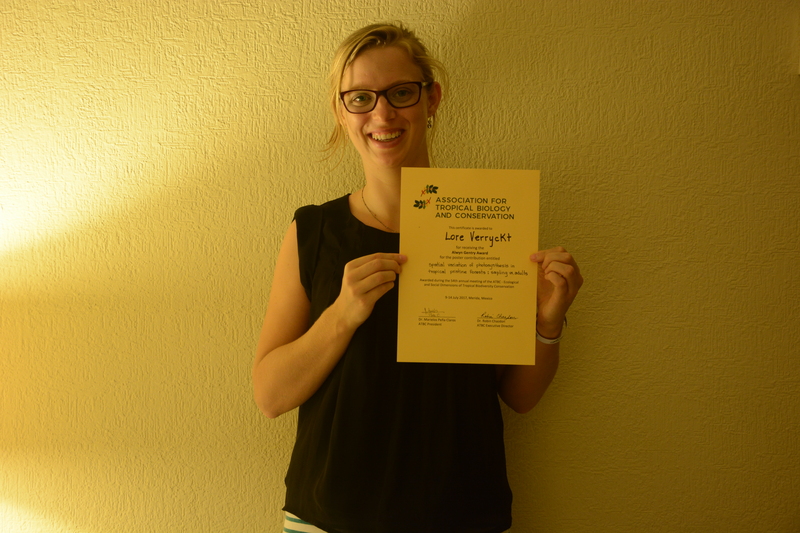 Lore wins the Alwyn Gentry Award for best student poster! There were a lot of sessions on animal conservation, animal-plant interactions and many talks about fancy birds. We went to sessions talking about the importance of working together with farmers for better agricultural production within a highly bio diverse framework. There were sessions about aquatic tropical biology, about plant photosynthesis, about lianas and even a couple about soil nutrients and their impact on the ecosystem (even though the researcher in question mentioned that he disliked the fact that soil nutrients are important after all). We listened to talks about wild boar (white lipped pekaris, yeah!) and mangrove forests. All in all the conference spanned a broad range of topics within tropical ecology and most of them were very interesting to learn about. 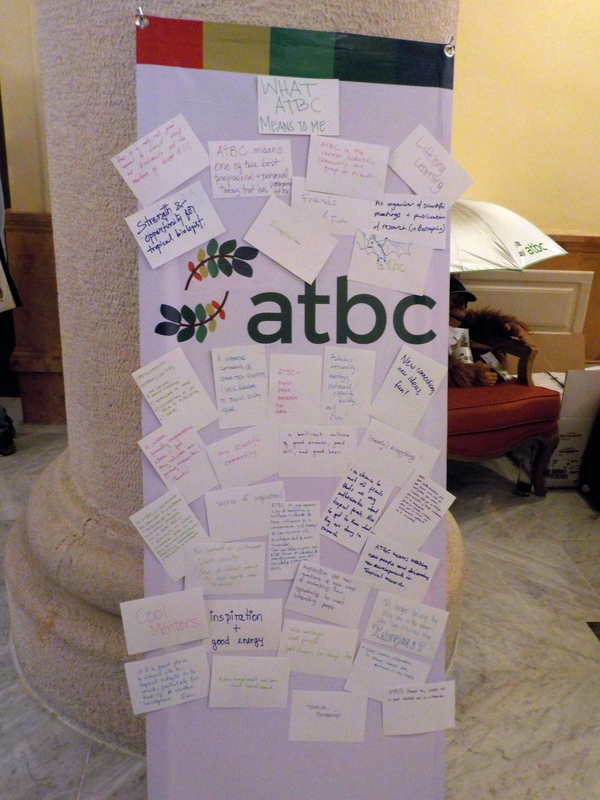 What does ATBC mean to you? Both Leandro and Lore presented a poster at the conference (see previous post). Each day about 70 people presented their poster. In practice this meant that those 70 people put up their poster during the morning break (between 10h30 and 11h00), and the poster presentations took place during the afternoon break (between 16h and 17h). So we (and all the other 740 people present) only had 1 hour to have a look at the posters, and every day we had new posters to visit. If you want to have a look at all of them, you spend less than a minute at each poster which is way too short! 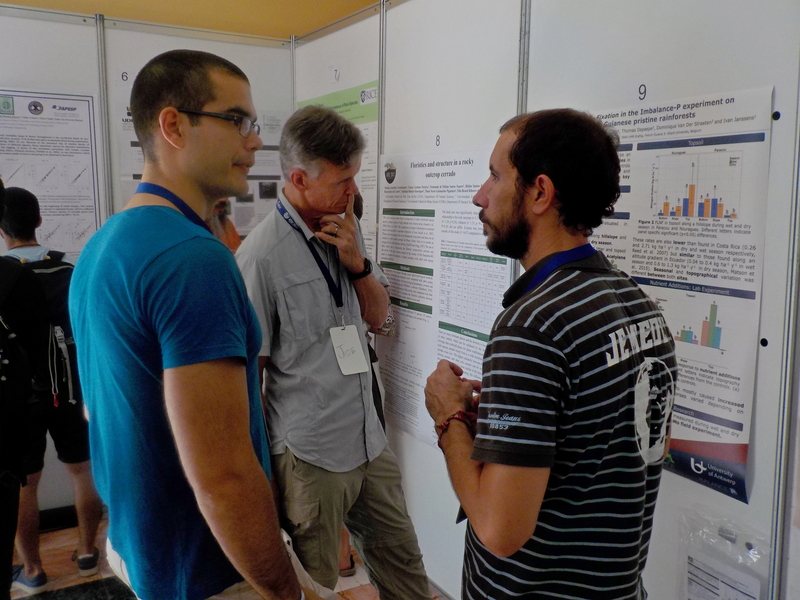 Our poster session took place on Wednesday. A pity they put all posters of the same topic on the same day, so we couldn’t ‘visit’ the posters we were interested in. But we had a nice hour of presenting a poster. A lot of people were interested. 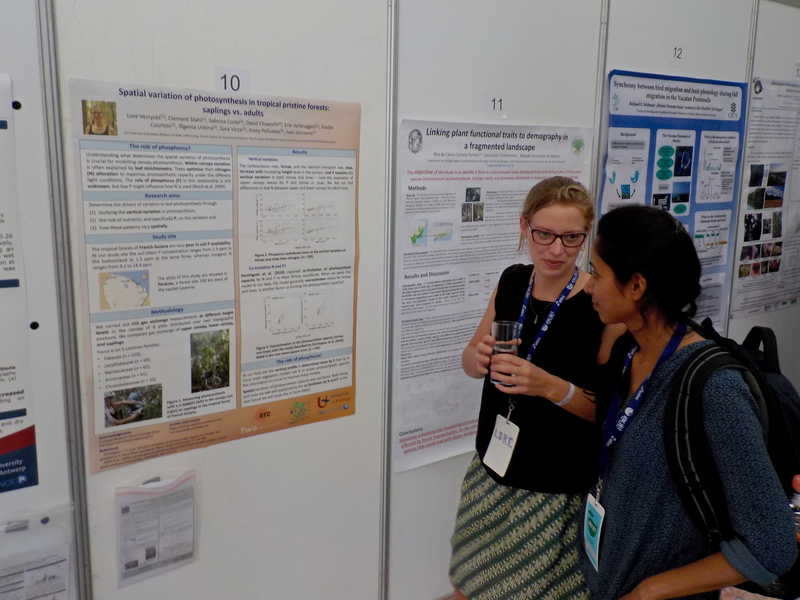 Even so much that several people skipped the plenary session at 17h to stay longer to have a look at the posters. On the last day of the conference several field trips were organized. 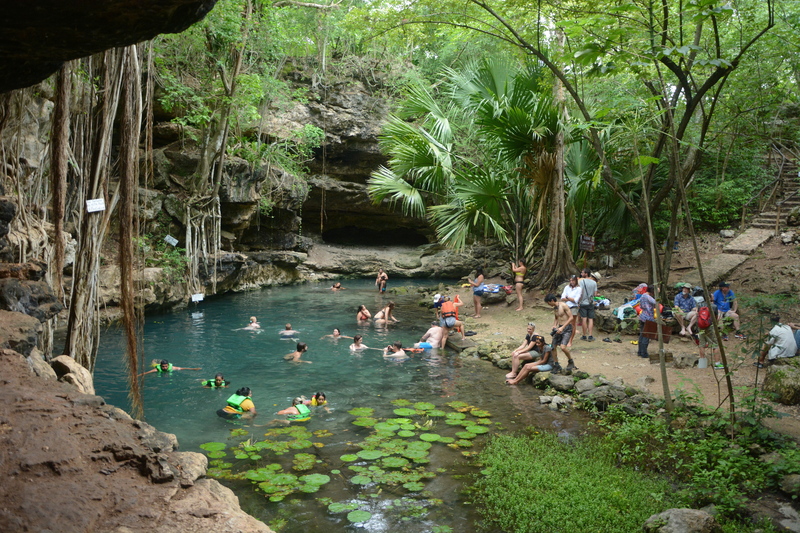 The one we participated at was a trip to Uxmal and surrounding cenotes. 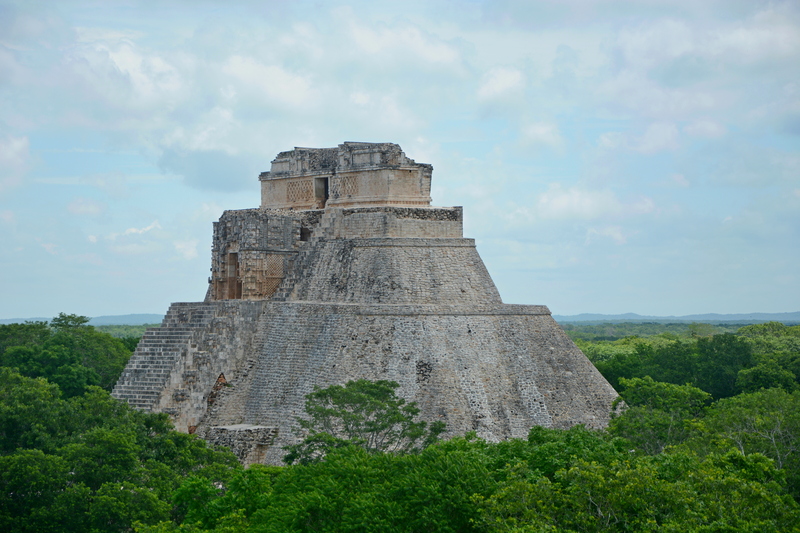 Uxmal is an ancient Maya city and is considered one of the most important archaeological sites of Maya culture (along with some others). 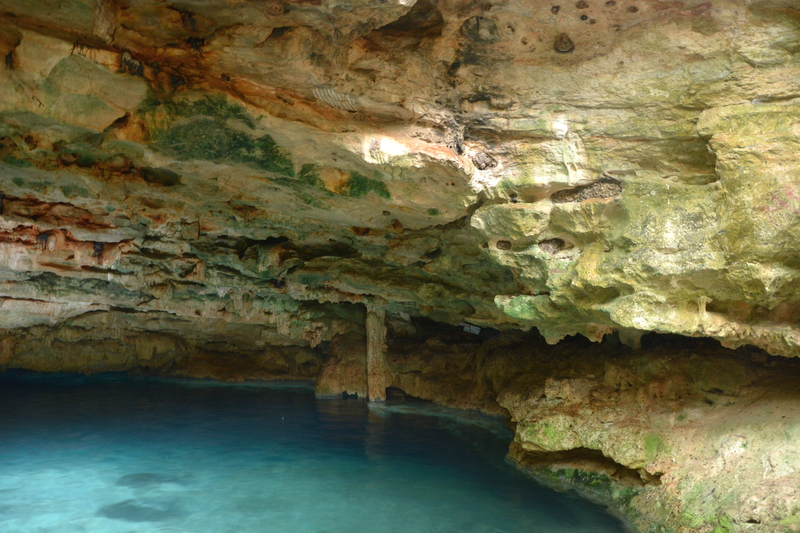 A cenote is a natural pit resulting from the collapse of limestone bedrock that exposes groundwater underneath. 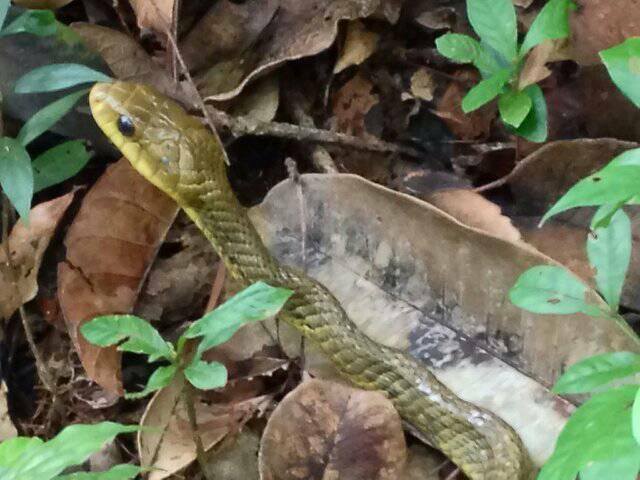 These are typical for the Yucatan Peninsula in Mexico. 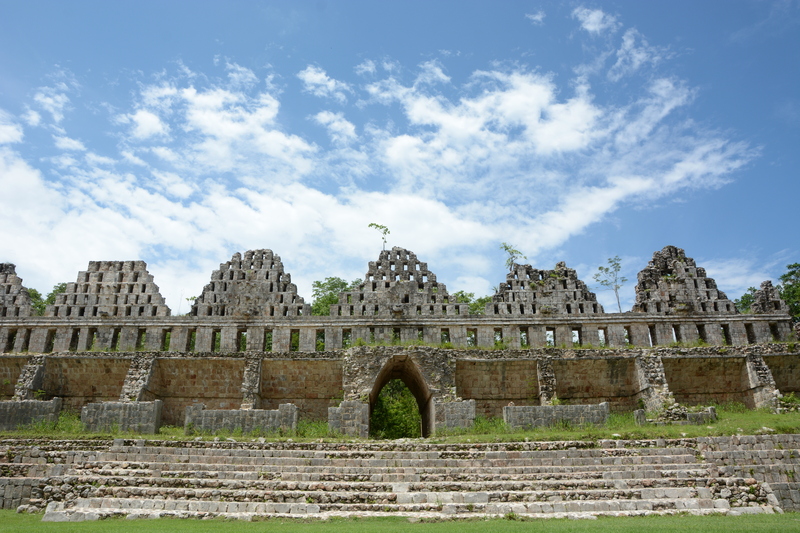 Both Uxmal and the visited cenotes were amazing! 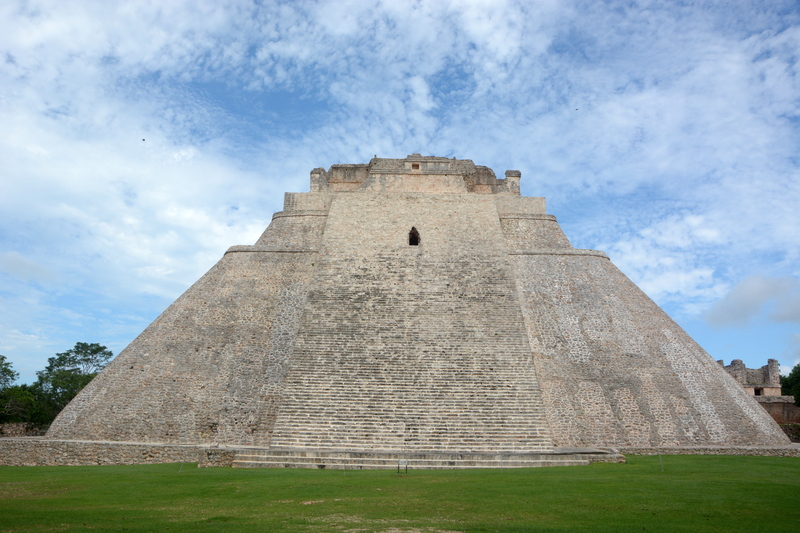 We were surprised that so few tourists find their way to Uxmal. Climbing one of the pyramids offered a nice view over the rainforests. 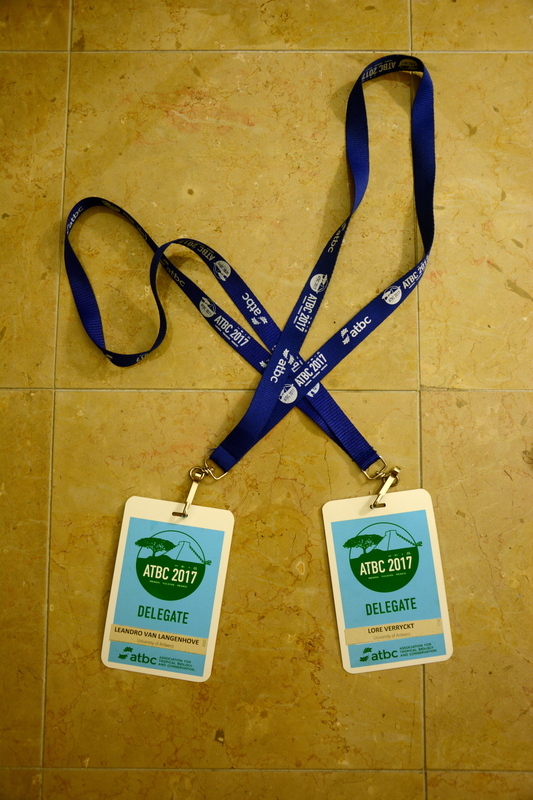 See you (hopefully) next year in Malaysia, ATBC! 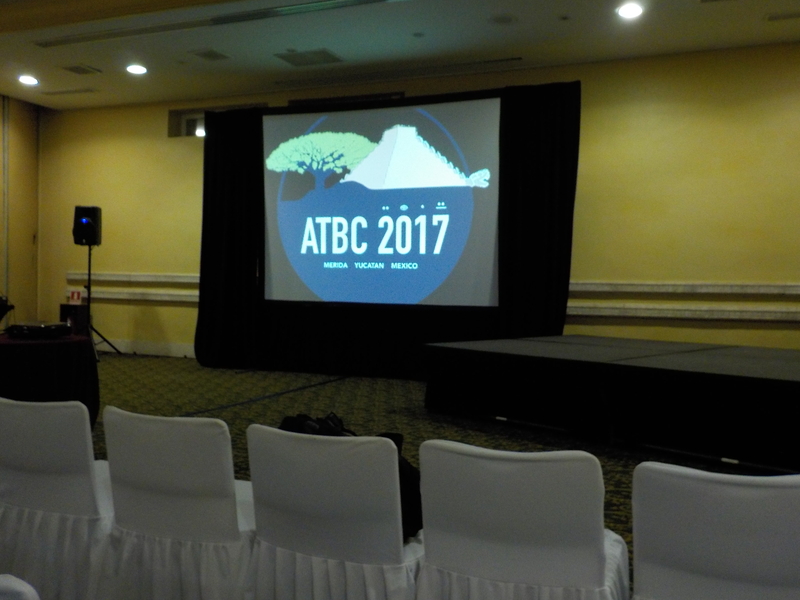 From Sunday 9/07 till Friday 14/7 we will attend the ATBC conference in Mexico. ATBC stands for Association of Tropical Biology and Conservation. Both Leandro and Lore will present a poster about their research. For those who are interested, we show our posters here as well. After a week of sampling (minus one day, they needed that one day to receive their shipment of equipment that got stuck in customs, again!) 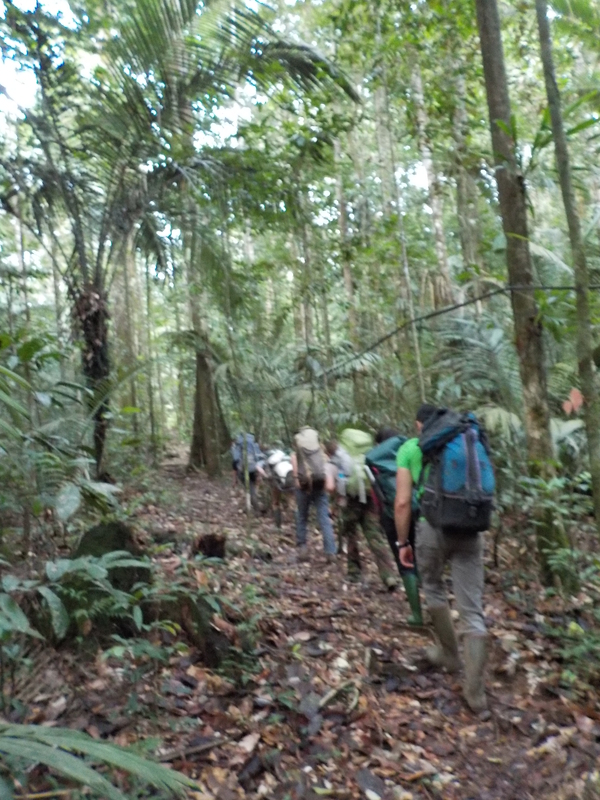 in Paracou the next mission the agenda was Nouragues. 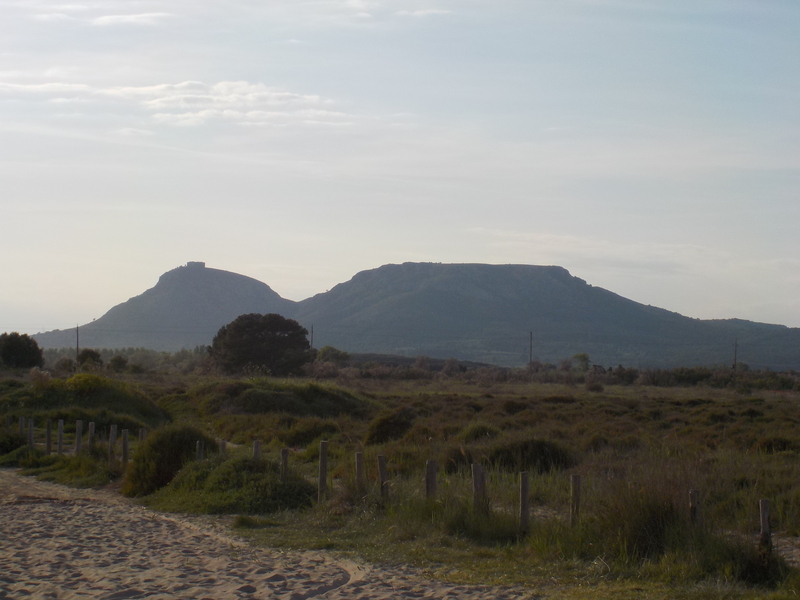 On Monday the 29th of May we all went to the Inselberg camp in the Nouragues reserve: the Spanish team and an Antwerp team, nine people in total. At 5h45 we left Kourou with our first destination Cayenne airport. At the industrial loading docks (they exist in FG, we couldn’t believe it at first!) the helicopter company HDF is situated, and there we had to drop off a large bottle of liquid nitrogen the Spanish team uses to freeze samples in the field. This helicopter would then deposit the liquid nitrogen, along with a lot of other equipment, at the station. You read it right, the liquid nitrogen got the short trip, we were bound for the long way round. Next stop: Regina. Here we take the ‘pirogue’ to Nouragues. At 8h30 we arrive at the house of Mr. Agassi, our ‘piroguier’. One little problem: he wasn’t home. After a short phonecall we learned he was in Cayenne, shopping. Apparently he wasn’t informed about our trip, although we planned it two months in advance. A ‘small’ hiccup at the CNRS administration, they forgot to inform Mr Agassi of our travel plans. He was, luckily, so friendly to drive back to Regina (Cayenne-Regina is a 1,5h drive!) to help us out. So with some delay we could continue our trip. 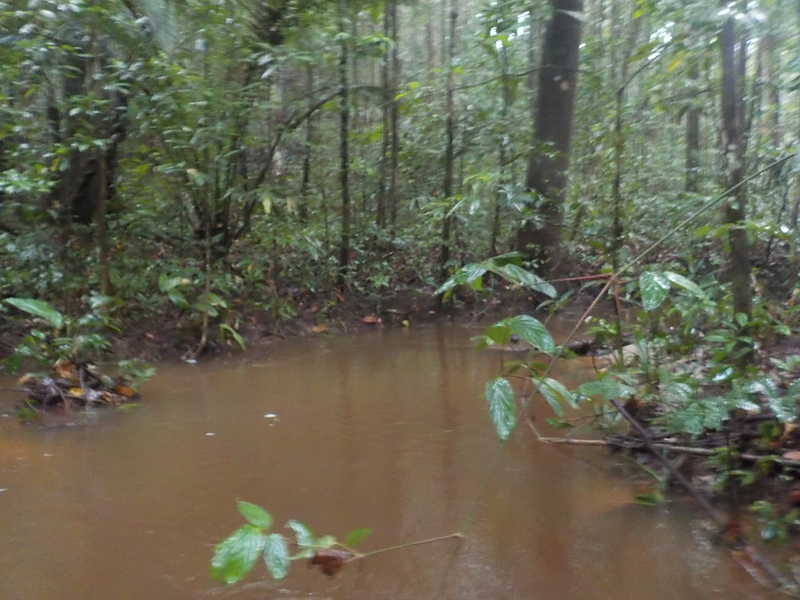 Once in the pirogue we were quickly reminded that it was rainy season… so we arrived in camp Pararé being cold and completely wet. We speak from experience and can tell you that the heaviest raincoat does not help one bit in keeping you dry while the rain is pouring down and you’re moving at +-40km/h on a boat, in the middle of the river. Because of our delay (Mr. Agassi not being home and therefore leaving Regina much later than planned) we quickly grabbed some crackers for lunch, our torch and a bottle of water and started the 2-3h hike to camp Inselberg, in the hope to arrive before the dark! Less than 2h after (usually they say the hike takes 3h, but without bagpack and with our colleague Elodie setting a murderous pace), we all arrived safely at the Inselberg camp. After a long day of transportation, happy to be at our destination, we all went early to our hammock. The next few days we were really lucky with the weather and everybody worked very hard. 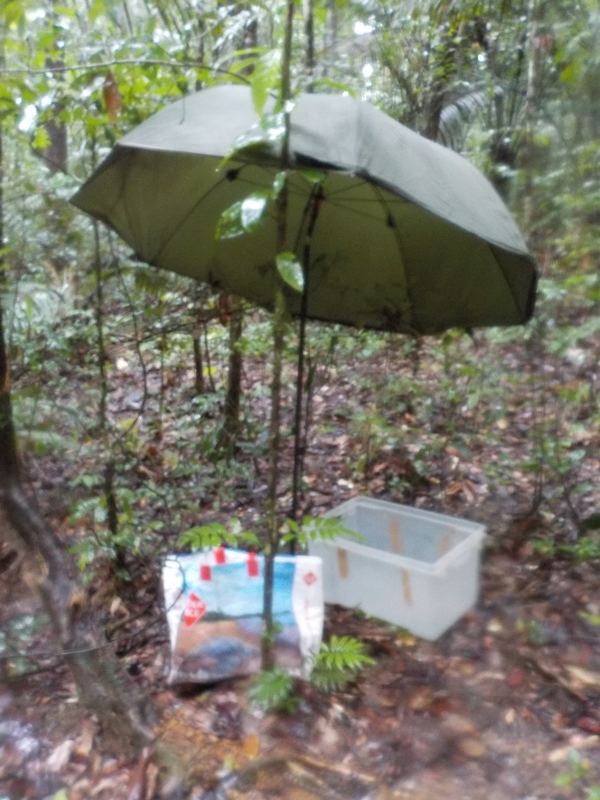 Our Spanish colleagues sampled soil and litter for analyses of metabolomics, stoichiometry and enzymatic activity. 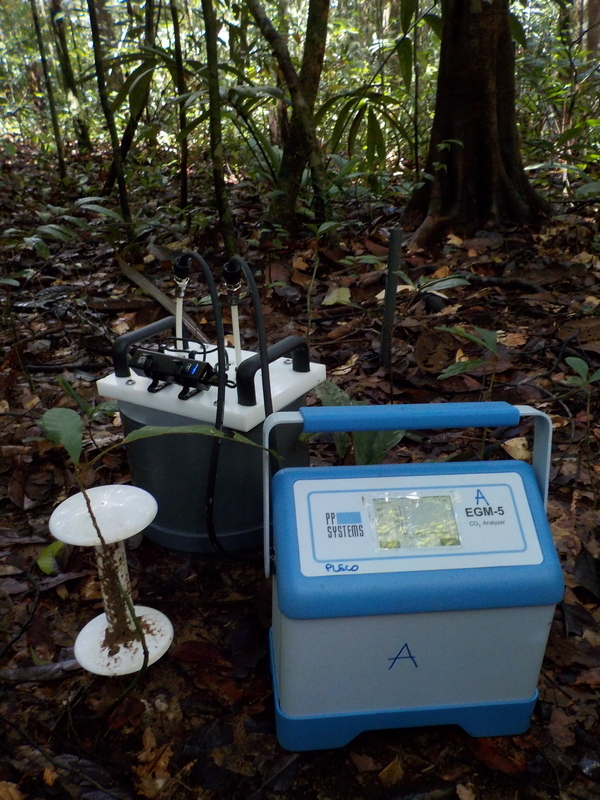 Leandro installed PRS probes and started his campaign to measure nitrogen fixation in soil and litter, while Clement, Elodie and Laetitia (our new colleague!) and Lore measured soil gas fluxes! 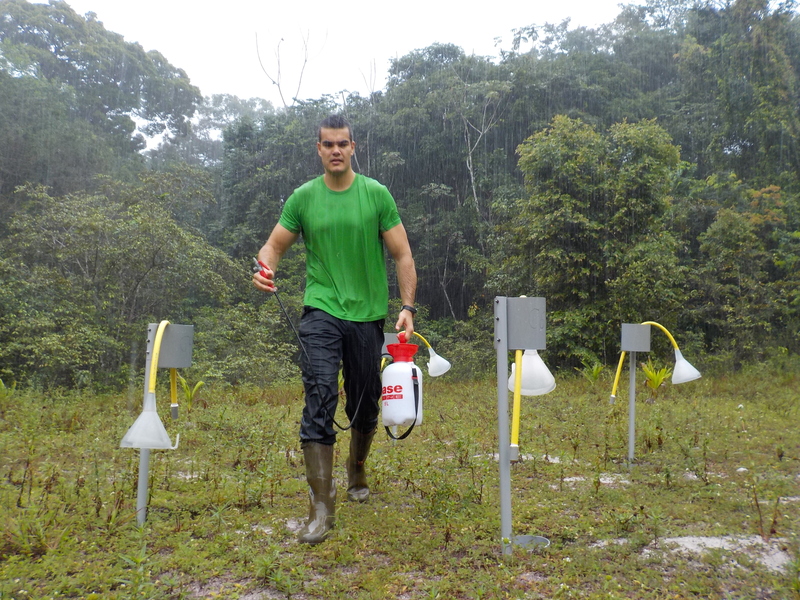 Leandro sampling soil and litter to measure nitrogen fixation! Measuring soil respiration and soil moisture. Elodie measuring soil gas fluxes. The third day in Nouragues, while Laetitia and Lore were walking back to the camp, Lore thought she walked over a beautiful liana (as we have a lot of them in Nouragues! 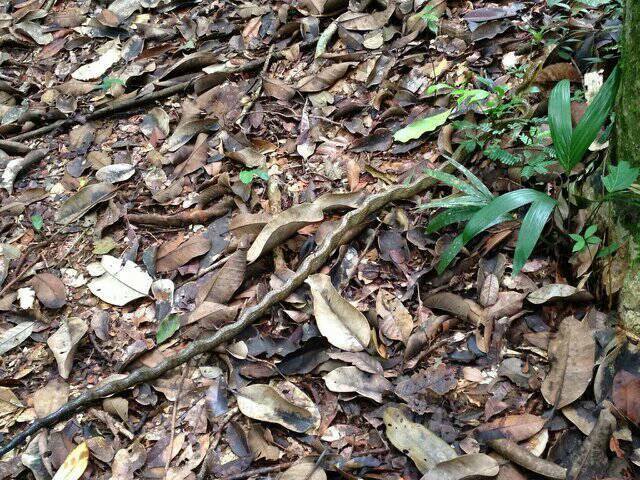 ), whereas Laetitia pointed out to her that it wasn’t a liana, but a beautiful ‘serpent chasseur’! The ‘liana’ Lore stepped over. 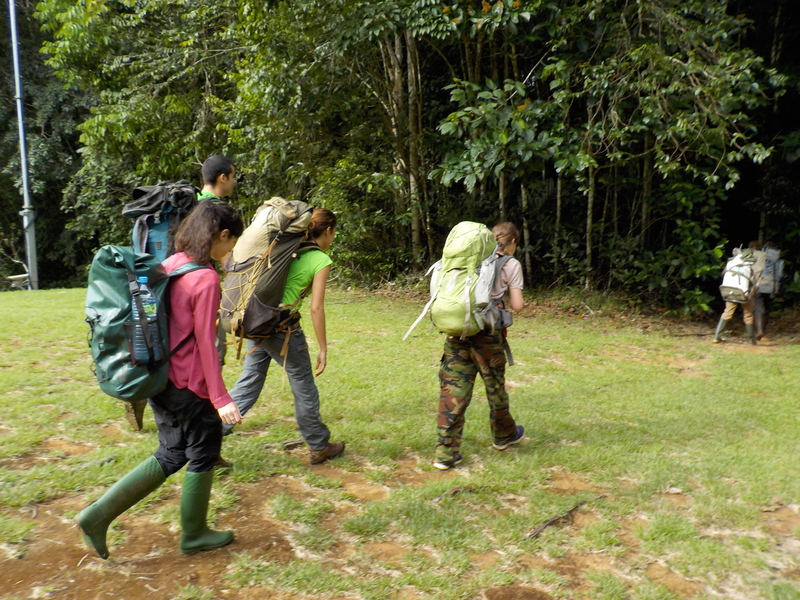 Elodie, Clement, Laetitia and Lore were the first team to return from Nouragues. And lucky as they were, they saw a giant anteater on their way to camp Pararé, and a swimming tayra and a couple of ara’s on the pirogue going back to Regina (the rest of the team hate them now and are really jealous)! 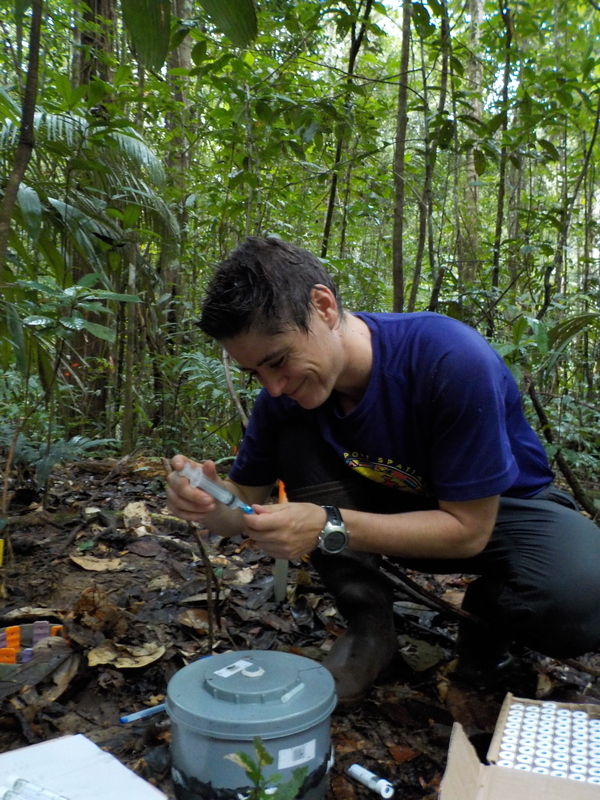 Since one week, Lore is back from Nouragues, carrying out our weekly measurements of nitrogen deposition in Paracou and washing PRS probes, which can take up to 4 days on your own (for 92 samples). In the meanwhile Leandro is still in Nouragues, finishing his nitrogen fixation measurements and washing PRS probes as well, while the Spanish (Catalan) CREAF team is sieving and racing against the clock to get their samples shipped before they leave the country. 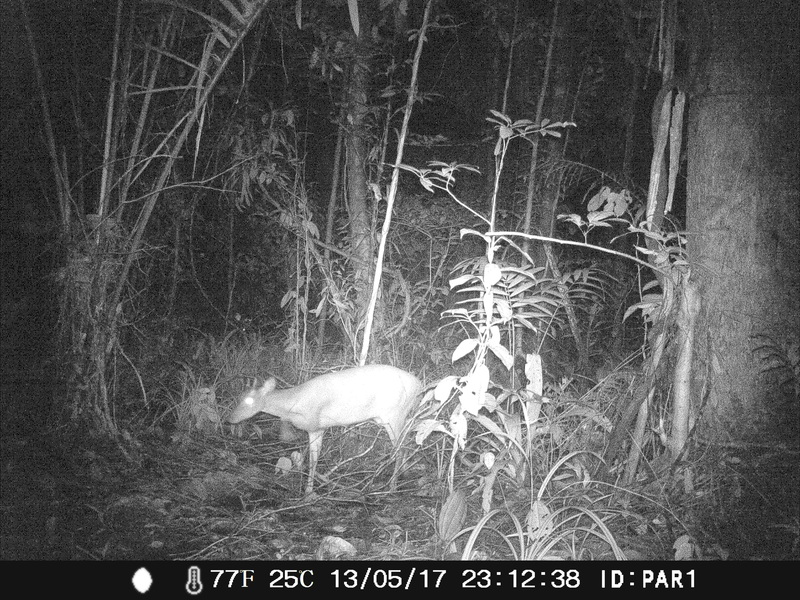 We recently installed a camera trap in Paracou. And look who we found: bambi! 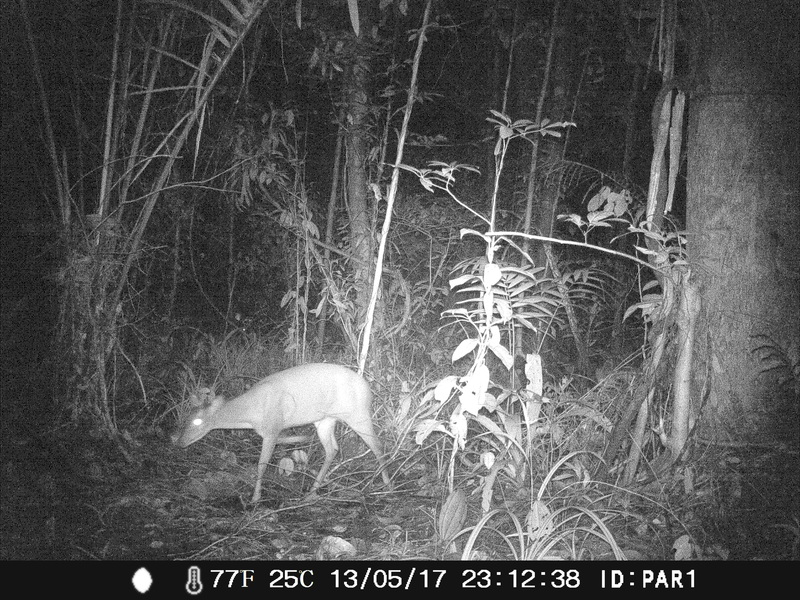 This beautiful deer walked past an experiment of Leandro close to the flux tower of Paracou. 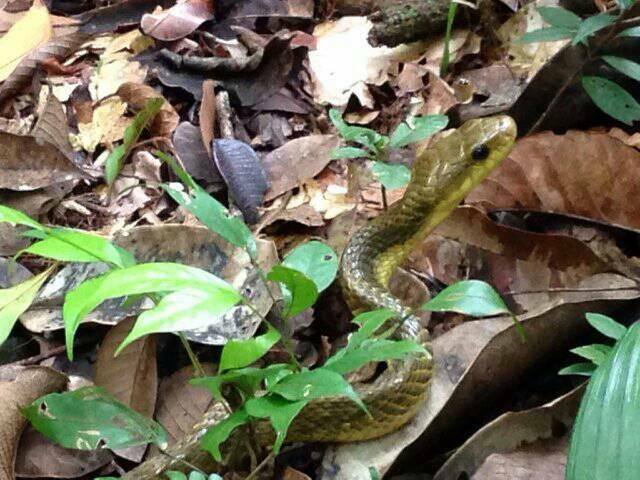 Next week we’ll install the camera in Nouragues; curious to see which animals we can catch on our pictures!! 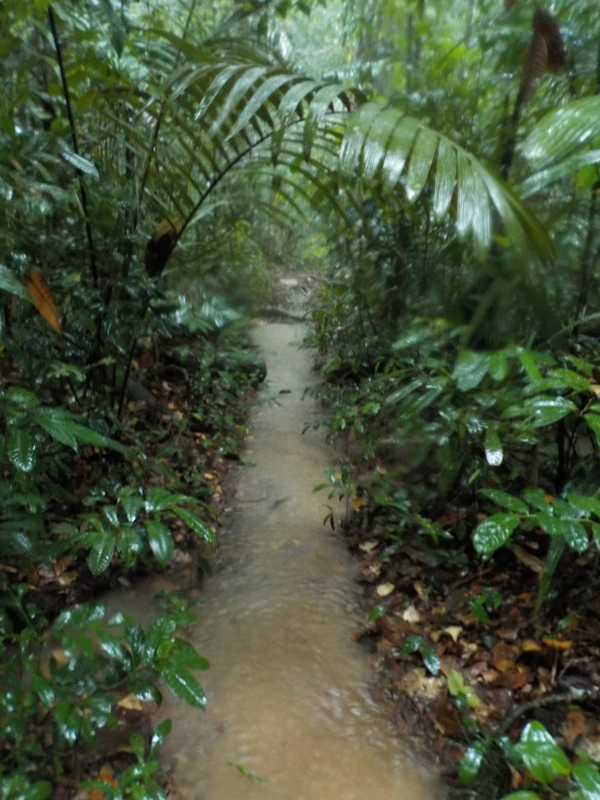 The rainy season turns the walking trails in the forest into small rivers, and small rivers into bigger rivers. 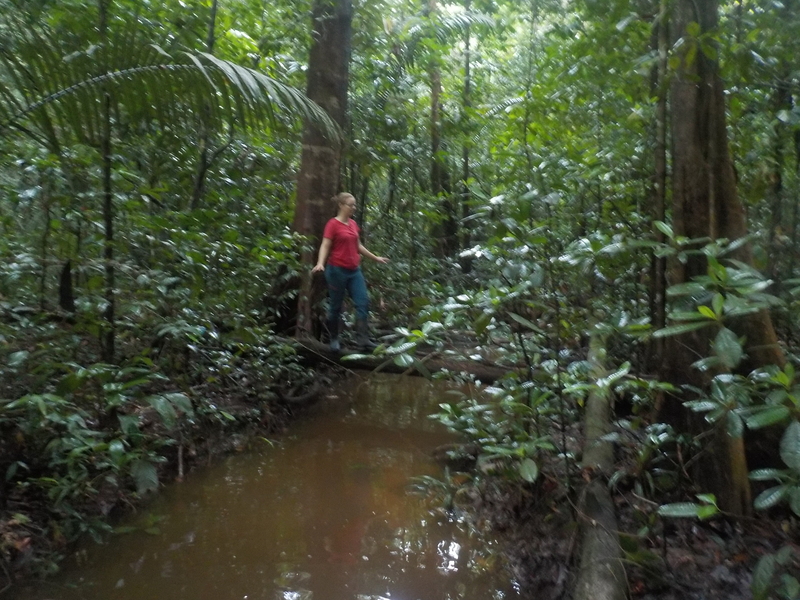 While we can cross some small rivers in the dry season only by walking on big tree trunks, we’re happy these trees are still sticking out above the water level in the rainy season! And yes, if you lose your balance and fall in, it’s cold. 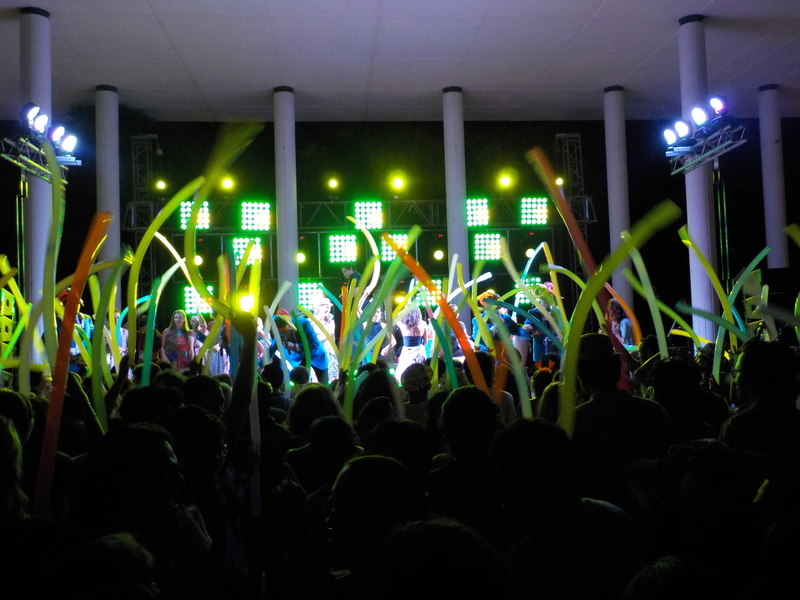 Paralyzed for more than a month, the social movement in French Guiana ended on the 21st of April after an agreement was signed. 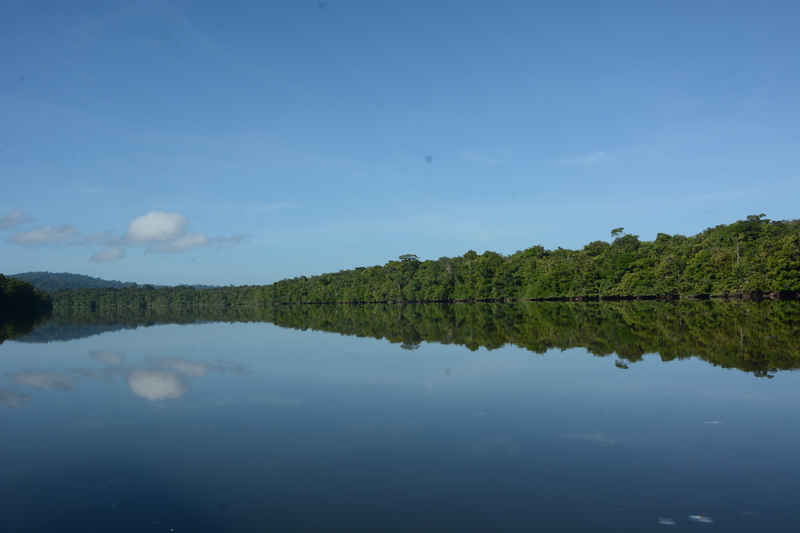 2.1 Billion will be made available for the future of French Guiana. 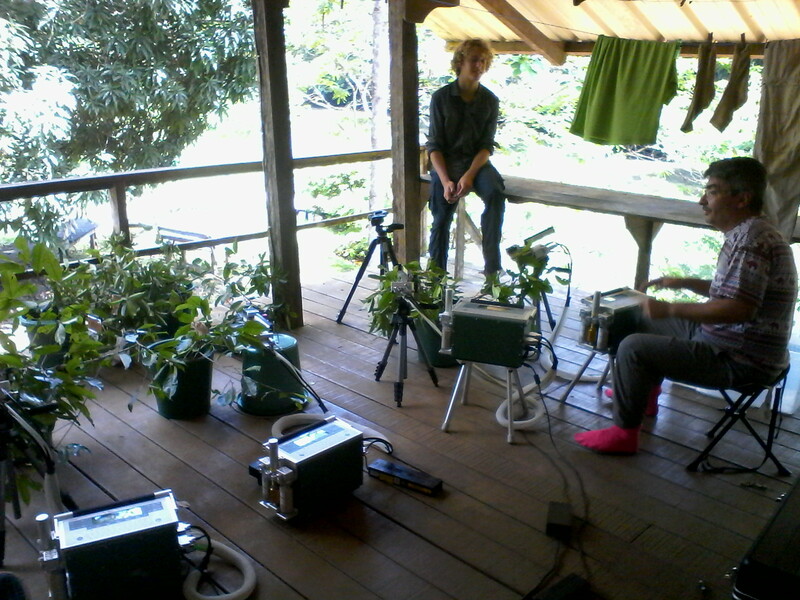 Finally we could continue with our fertilisation experiment, after having to reschedule several times. Thanks to all the extra hands for carrying out this tough job together with us! 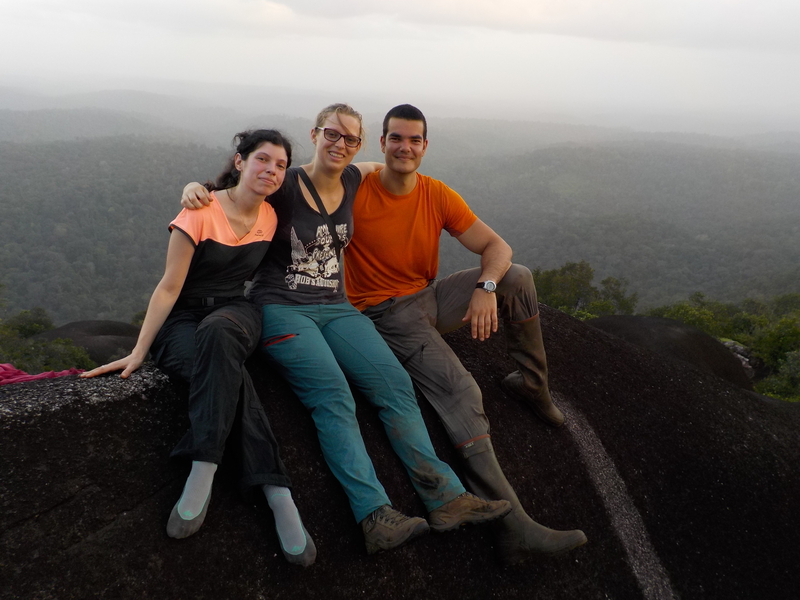 Irene, Lore and Leandro on top of the Inselberg – Team UA present! 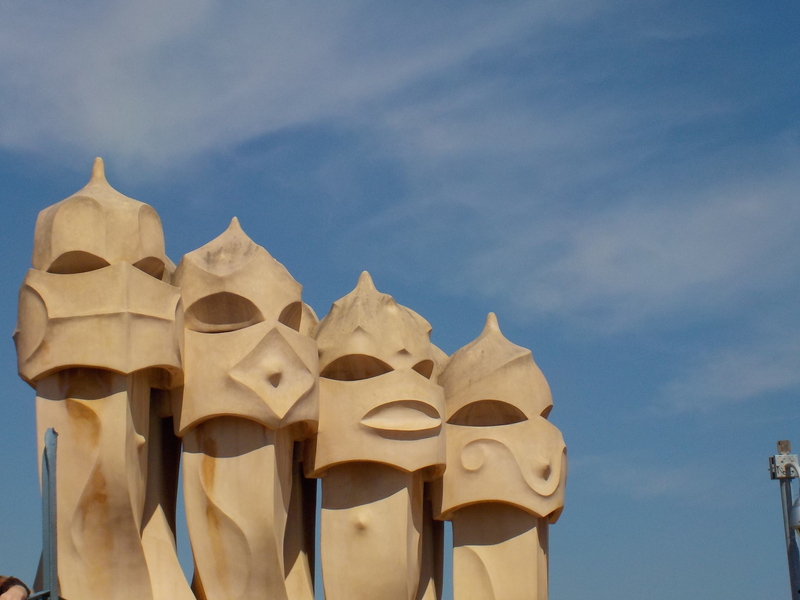 Recently we spent 1 week in Barcelona to meet our Spanish colleagues at CREAF, participating in the Imbalance-P project. We put most of our data together to make one big database and discuss synergies based on these data. 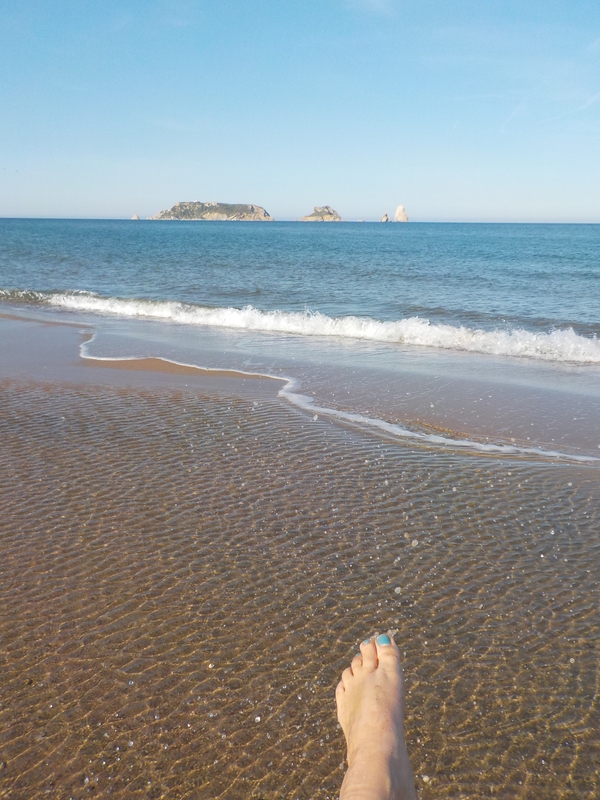 Forgotten that Barcelona can still be cold and wet in April, Lore only packed her sandals with very cold feet and a cold as a result. 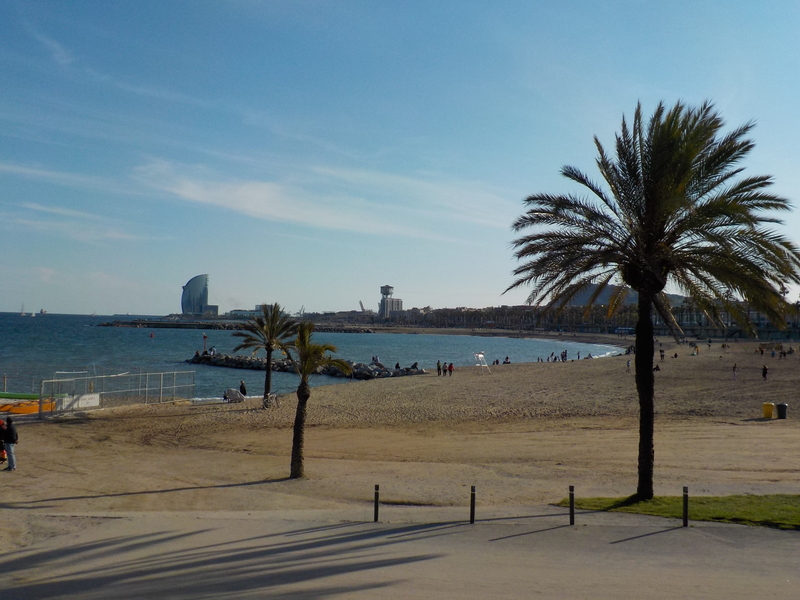 But luckily we also had some nice weather and some time to visit Leandro’s father and Barcelona city! 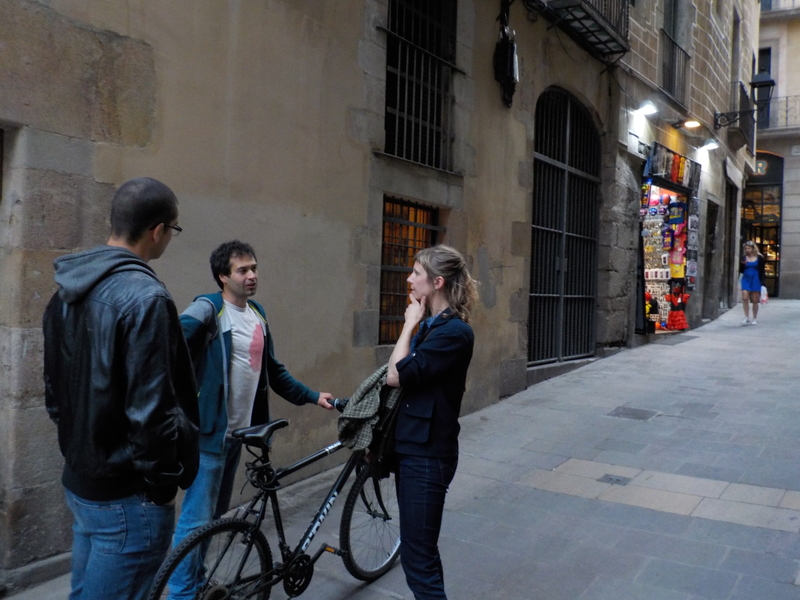 Oriol giving Leandro and Joke a historical tour through Barcelona City! 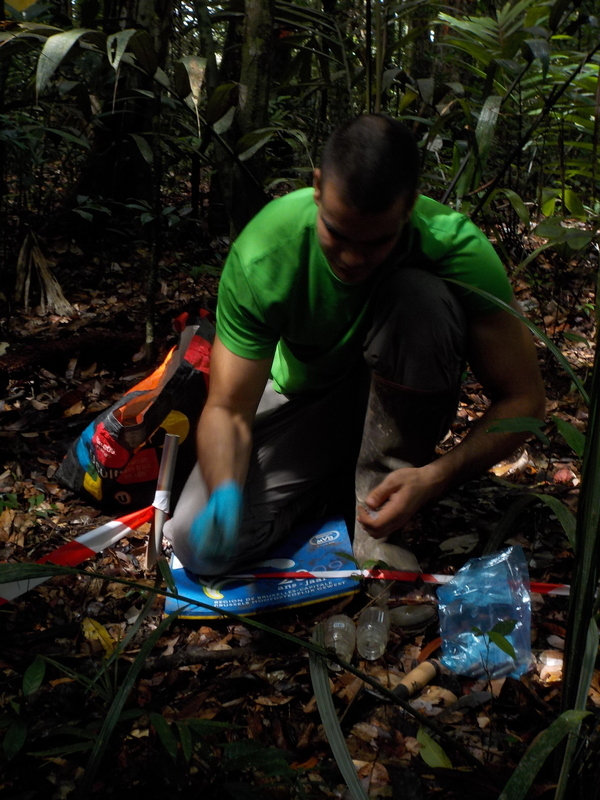 After that week we went back to French Guiana where we are continuing our weekly measures of N-deposition in the forest and on the old helicopter dropzone, which we use as open space. 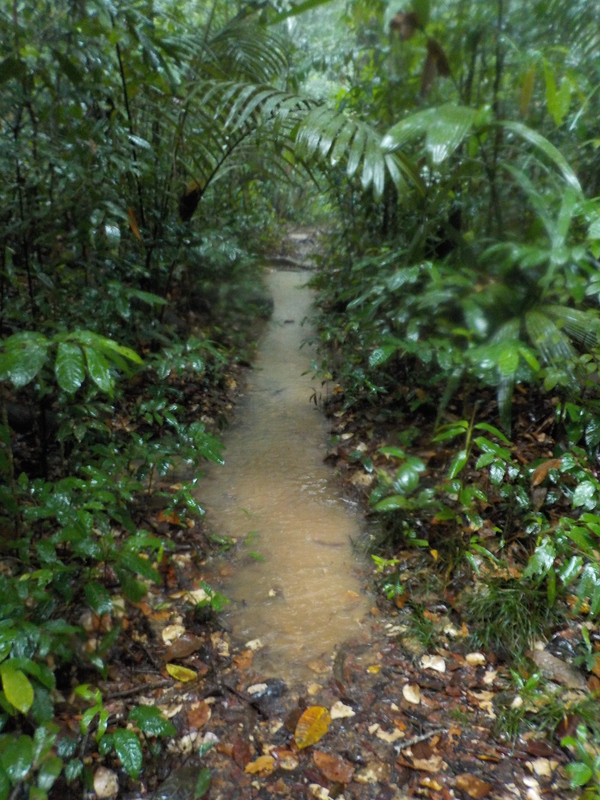 We discovered that our walking paths turn into rivers with some local waterfalls in the rainy season. We even had to ‘build’ blockades for our water bottles avoiding they would ‘go with the flow’! 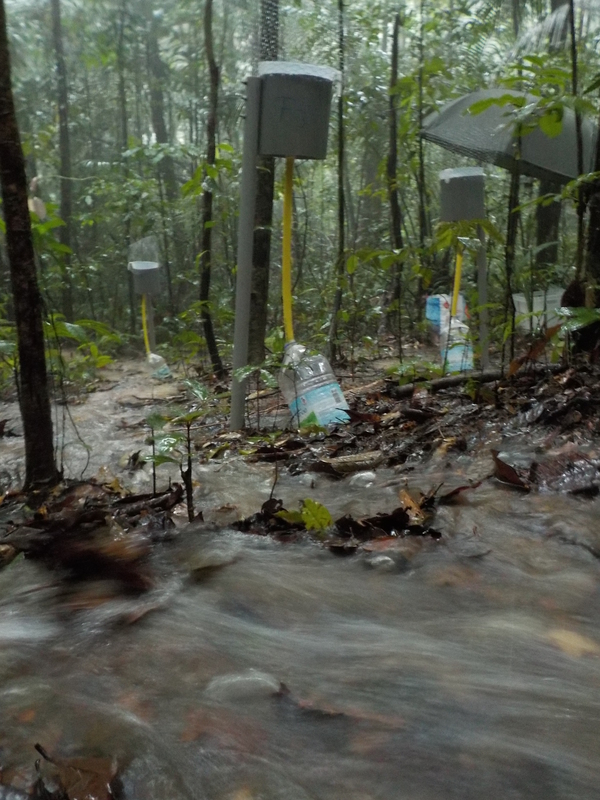 For information, the bottles serve to store the rainfall and we go to empty them once a week, after which we chemically analyse the water to know which ions are introduced into the environment through the rain. Luckily we have a big umbrella! 1st ‘Verryckt et al.’ paper! 18-days strike in the Belgian news! Some days ago both ‘De Standaard’ and ‘De Morgen‘ reported already about the situation here.